There are many factors that make energy efficient windows. And let’s face it, windows are not a small purchase. We want you to be prepared when you buy new windows, so we’ve done the hard work for you. This way you’ll be better educated on your new window purchase. Here’s what you need to know before you start shopping for energy efficient windows. 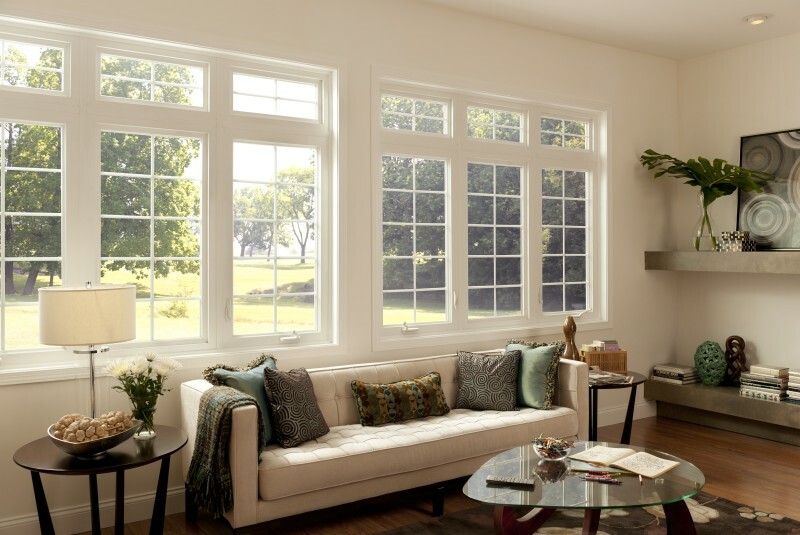 Three factors to consider when shopping for energy efficient windows. 1. The glass is the most important part of an energy efficient window. Glass packages have the greatest effect on your window’s energy efficiency. You may pay a little more for a great glass package up front, but you’ll save more in the long run. Here are a couple glass package options to keep in mind. Low-E reflects infrared light keeping heat inside in the winter and outside in the summer. It can also help keep your carpets and furniture from fading. Either Argon or Krypton can be placed in between glass panes to provide greater insulation than regular air. For more information on window glass options click here. 2. Window frame material plays a key role. Not all window materials are created equal. Windows come in a number of different materials, including vinyl, wood, aluminum, fiberglass and composite. Vinyl windows are long-lasting, energy efficient and can be customized to fit any size opening. And unlike wood windows, vinyl will never need repainting. Although they are energy efficient, wood windows are high maintenance. They have to be painted or stained regularly to remain protected from the elements. Aluminum windows are low cost and low maintenance, but they offer the least energy efficiency of any window material. Fiberglass windows offer a strong window frame, but they’re going to cost you. You may pay a healthy 15-30% more for fiberglass windows than you would for vinyl windows. Composite windows combine different window materials to take advantage of the benefits of each window material. Although these windows typically perform well, they are the most expensive window in the market. 3. Consider ENERGY STAR certified windows for the ultimate energy efficiency. ENERGY STAR is a government supported program that uses specific criteria to define an energy efficient window. How does ENERGY STAR determine what makes energy efficient windows? By measuring four different parts of the window: the glass, the gas, the spacer and the reinforcement. The combination of these factors influences the window’s U-value and solar heat gain, both of which are drivers for meeting the ENERGY STAR performance level. To be labeled as an ENERGY STAR product, the U-factor and SHGC (Solar Heat Gain Coefficient) ratings must be less than or equal to those established by ENERGY STAR. To see the ratings click here. The U-value or U-factor is commonly described as the amount of heat transferred through a material. The lower the U-factor, the slower the rate of heat flow and the better the insulating value. The SHGC refers to the amount of heat from the sun that windows and doors allow into the home. The lower the number, the greater the ability to reduce the amount of heat absorbed into the home. Ready to invest in energy efficient windows? Take the first step. Build your dream windows and patio doors with Simonton’s “My House” tool. “My House” allows you to organize the number of windows and patio doors you want by room. And, after you’re done choosing the windows and doors you want, you can easily send your choices to your contractor, so they will know exactly what you’re looking for before they even see your house. Start building your house here. I didn’t realize that vinyl windows were so customizable. I guess that is part of what makes them so cheap and energy efficient. My wife and I have been talking about having our windows replaced. We will definitely look into vinyl to try and save some money on our bills. I am really happy that you talked about fiberglass window frames. I didn’t realize that they are going to be 15 to 30 percent more money than vinyl. However, you also pointed out that they are the strongest option. So, it seems like they would be the best for a long term investment. The windows in our home are pretty old so my husband and I are in the market for new ones. I didn’t know previously, that there are windows that are gas filled in order to better insulate the home. Are these better at regulating inside temperatures than the Low E windows? We’re looking for windows that will be best for moderate weather. Hi Kourtney – You’ll want both a gas fill and Low E. Usually, a gas fill comes standard with all double or triple pane windows. It just depends on the gas you want, Argon or Krypton. But either are fine! Low E is a film on windows that helps deflect UV Rays. Typically, this isn’t standard on windows. And, you may not need Low E on all of your windows. It’s best on windows that face the Sun because it will help protect your floors and furniture from fading due to damage from UV Rays.